Bazaar, the Mighty Olive, and Square Olive. 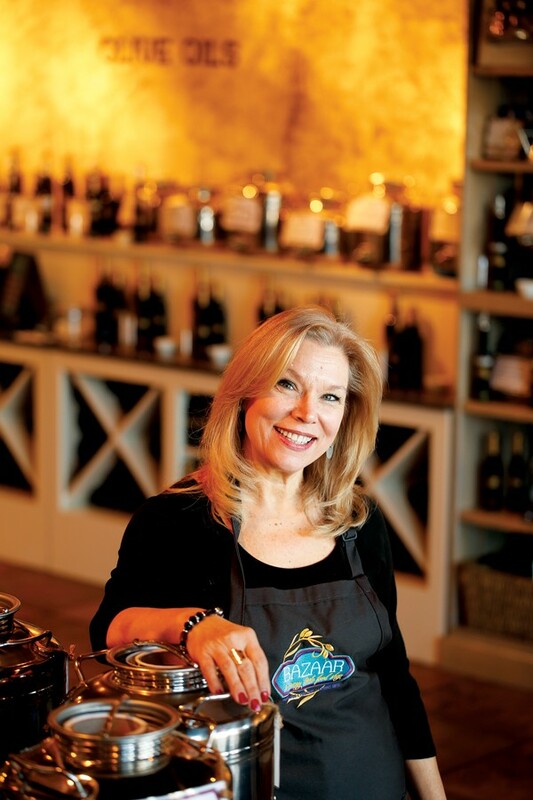 Before Sandy Barrios opened the specialty olive oil and vinegar shop Bazaar with her husband John and partner Sheila Smith Thomas, she worked in the insurance industry. "This is literally the first time I've ever sold anything that was fun. Did you ever have fun buying insurance?" Barrios asks. 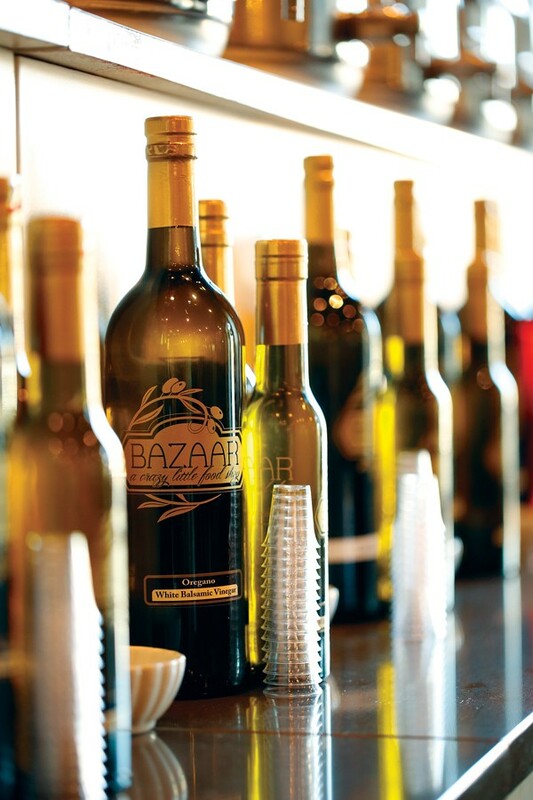 Bazaar, which opened late last year at Carriage Crossing in Collierville, is billed as a "crazy little food shop," but with its rustic décor, it couldn't be more inviting. Tasting cups sit next to each flavor olive oil and balsamic vinegar. Tasting before you buy is not only expected but encouraged. Four bottle sizes are available, and prices start at $4 for 60 milliliters up to $24.99 for 750 milliliters. The store is currently rotating 40 flavored and traditional vinegars and oils, the latter of which are from the Southern Hemisphere and were harvested in the spring. "You're getting the freshest oil that's available, and that comes through in the taste," Barrios says. According to Barrios, Bazaar's staff hasn't had to do nearly as much education on the concept as they anticipated. "It's so much fun to sit back and watch. They'll taste one and you'll just hear them say, 'Ah ... oh wow!'" When Carol and Sam Braslow took a vacation to Pensacola in May, they weren't expecting to leave with a business plan. "There was a store there called the Bodacious Olive. I'd never seen anything like it in my life," Carol says. With their store The Mighty Olive, the Braslows would be filling a niche that they hadn't known existed. They had been looking for a new business to create since Sam's family sold famed A. Schwab two years prior. They found a spot in Laurelwood and signed the lease in August. They opened November 11th and originally wanted to keep it quiet. "But then everybody found out about it!" Sam says. They currently have 50 oils and vinegars on rotation, and there's a bar for patrons to watch demonstrations as well as mull the tasting possibilities. "I like to mix the chocolate vinegar and the coconut vinegar and the almond oil and make an Almond Joy," Sam says of his favorite concoction. Their Tuscan Herb olive oil, blackberry ginger balsamic vinegar, and fig balsamic vinegar have been among the top sellers. Bottle sizes range from 200 milliliters for $10.98 up to 750 milliliters for $24.98. Additionally, they have pasta, cheese, books, Olivina bath products, and chocolate from Ethereal Confections for sale. Says Carol, "We'll make you a believer before you leave." After 32 years of taking care of animals, veterinarian Kenny Ford is ready to take a chance on the tastes of the two-legged species as he prepares to open The Square Olive in March at Overton Square. Ford plans to start with around 24 oils and vinegars available in-store and will have handmade soaps and lotions made with olive oil by his sister. He also plans on renting his space for small oil education gatherings. The distributor that Ford will be working with will bring in a supply of oils from Argentina, but it might be just a matter of time before you're dressing your salad with fruits harvested in the South. "I've been looking, and there are a lot of domestic olive oil vineyards, mostly out West. Some are now coming to Florida and southern Alabama and Georgia," he says. "Everything doesn't have to come from the Mediterranean or doesn't have to be imported. I won't be limited to just one source, one place, one region of the country." As of November, Ford officially hung up his stethoscope. "Instead of doing 50 to 60 hours a week at a veterinary clinic, I'll be doing it at a store," Ford says. "It's different. I'll meet different people. It's a totally different thing." Two growler stations open, another in the works. Sweet Noshings in Overton Square; Phillip Ashley Chocolates in Cooper-Young.